January is DIY Month & A GeorgiaPeachez GIVEAWAY! It's official, it's DIY month around Chez GeorgiaPeachez. I am on a roll peeps, and I don't think you can stop me! Except for work, damn it. I just got jobs for next week that have me booked up every day! The paint brush is smokin' and I've got to run to the hardware store for more drywall anchors! It all started with a little rearrangement of my kitchen wall decor. Then I found the most awesome Christopher Lowell desk and chair on Craig's List for a song. I LUV Craig's List. 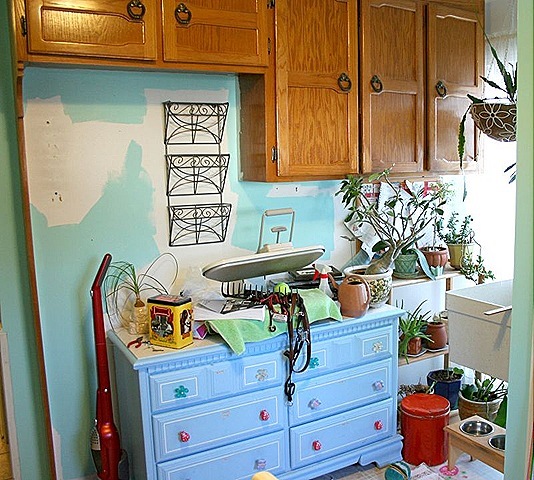 That desk was all I needed to jump start the laundry room remodel. I have an awesome laundry room. It's the size of a small bedroom, sunny and bright. It even has crown molding! Whoever built my house had a crown molding fetish. This house is loaded, but that's another story for another day. Quite the catch all room. There is a closet too with the washer and dryer. I'm almost done with the remodel, but here is a sneak peak at one corner. It's going to be a great reveal! Remember the apron I was working on? I got the pattern here. I've made one apron from this pattern using vintage feedsacks and I added a vintage pot holder as a pocket on the front. SO, for DIY January I am going to GIVEAWAY this apron! Just leave me a comment ON THIS POST making sure to give me a link so that I can find you. I'll be taking comments (international welcome!) through next Friday, the 16th. Saturday morning, the 17th I will randomly pick a comment number and announce the winner. I appreciate everyone that views my blog and leaves me all the wonderful comments. I enjoy sharing my little world but most of all I enjoy reading your blogs and all that you share with me. aw shucks. that apron is adorable. i love vintage aprons and vintage-style aprons. i’d love to win! Oh my goodness, oh my goodness. This is honestly the cutest apron I’ve ever seen. Seriously, it’s calling my name, like it was made just for me. It has me written all over it. Please enter me in this amazing giveaway!! Please count me in too 🙂 And thank you!! You made a gorgeous apron. I would be very lucky indeed to win such a beautiful apron. YOur apron is great but your laundry room is wonderful! 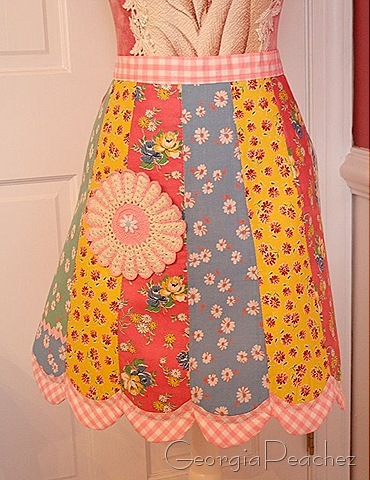 Beautiful apron…feedsacks are my fav.!!! 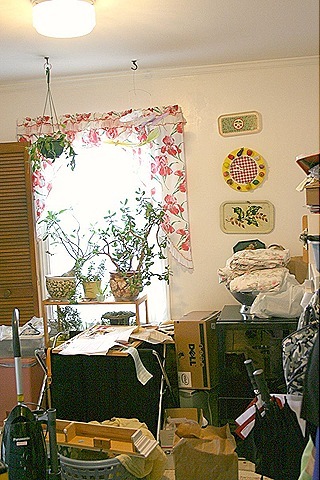 You know it is great to see that others do have a bit of clutter and you truly inspire me…I have TONS of clutter but I made the decision on the 1st that I have got to beat it! Take care and keep up all of your great works! oooohhhh that apron makes me drool!!! I love what you are doing to your room. I am looking forward to seeing what you do! As a new comer to craigslist..I am envious of your find!!! Such a lovely, lovely apron! And Ack! The remodel is awesome! I love the fruits and veggies clock! Gotta make one of those for my kitchen! I love aprons and your’s is darling!! Thanks for the chance to win. I LOVE the apron. I don’t have a blog but read yours all the time! Please count me in for the giveaway! Euna at flantiquer@cox.net. Adorable apron and I love the way your laundry room is turning out! How wonderful to have so much room in there! 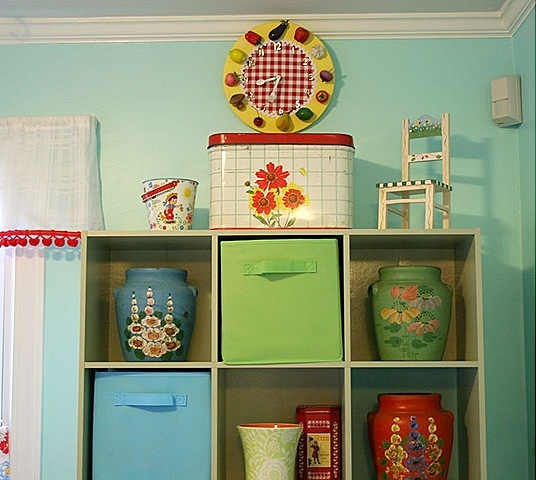 Right now my sewing room is the catch all room and I am very interested in how you get everything spruced up. I just may want to use a couple of your ideas! Thanks for the chance at that sweet lil apron! I know just where it would hang in my kitchen. 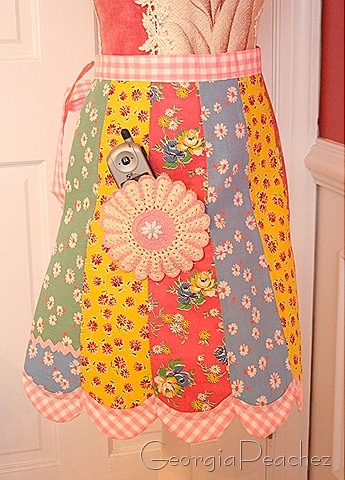 I love the little cell-phone holder in the apron! This would be a nice apron to own! That is the coolest apron EVER….reminds me of my grandma. I would love an opportunity to own this. Thanks for your generosity! I’ve never been an apron wearer … but never had such a pretty one to wear. AND – my laundry room is “unfinished but I’ve started hanging fabric on the walls (studs) and am now inspired to do a little more fix-up. THANKS! wow that’s a fantastic apron…it is so lovely! The apron is adorable! 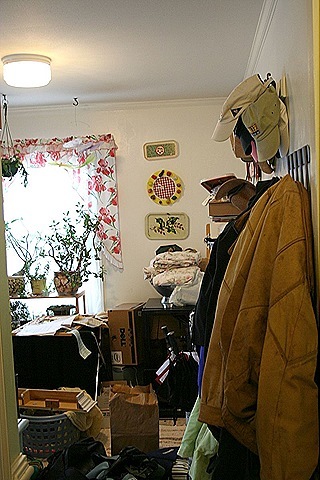 And I have laundry room envy… mine is so small that it is literally only the width of the washer and dryer.